Lady Elliot Island, Great Barrier Reef. from the majestic Glass House Mountains just north of Brisbane to the iconic Fraser Island, it's a destination abundant in nature. Australia's Nature Coast is your naturally abundant destination for National Parks and State Forests; bush walking and hiking; fresh water and beach swimming; snorkelling and diving; canoeing, kayaking, cruising and whale watching; four wheel driving; food trails, farmers and artisan markets; and of course, relaxing! 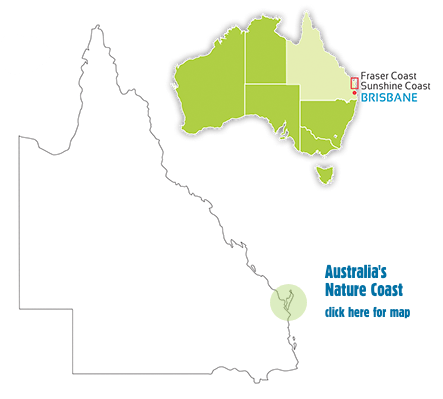 Spanning Queensland's Sunshine and Fraser Coasts, Australia’s Nature Coast offers authentic and immersive natural experiences in some of the world’s most diverse and pristine National Parks, rainforests and waterways. From the Sunshine Coast Hinterland with the majestic Glass House Mountains, through Noosa with its sophisticated beach culture, and Rainbow Beach with its iridescent coloured sands, the unrivalled whale watching and aquatic playground of Hervey Bay, to the Great Sandy Straight leading to iconic Fraser Island - you’ll fall in love with some of the most pristine places to visit in Australia. Australia’s Nature Coast features numerous unbeatable natural encounters including two UNESCO Biosphere Reserves side by side - the Great Sandy Biosphere and Noosa Biospheres; World Heritage listed K'gari Fraser Island; Lady Elliot Island - the most southern island on the World Heritage listed Great Barrier Reef; 47 State and National Parks, Reserves and Forests; over 200 kilometres of pristine beaches, calm rivers and waterways with an abundance of flora and fauna. Such world-class nature credentials are equally matched by the plethora of attractions and touring options available, with personal and immersive experiences being paramount to Australia's Nature Coast's tourism offering. Similarly, a broad range of accommodation styles cater for a variety of tastes and budgets - from quaint self-catered or B&B lodges nestled in the hinterland, to luxury apartments and hotels just moments from the beach. Finally, an appetising variety of regionally sourced produce makes for a taste sensation that can be sampled at a multitude of restaurants, breweries, food festivals and farmers markets. From paddock to plate, trawler to table - the region's fresh and bountiful local produce is something to be celebrated. Make the most of your time in Australia, by following one of our specially developed itineraries that takes in the Sunshine Coast, Fraser Island and the Southern Great Barrier Reef. Take time out for yourself, reconnect with family and friends and explore Australia’s Nature Coast.